Customers and sponsors of Univision Deportes can soon look forward to having the newest deltatre augmented reality technology inside their studio setting that features visually compelling graphics, insightful data and football tactical analysis in real-time, for their upcoming FIFA World Cup Brazil 2014 broadcast. The Sports Techie community blog touches on how their in-studio sports coverage project to provide “The best viewing experience” in the industry, builds upon deltatre’s world-leading experience in providing cutting-edge graphics solutions to the Sports industry. This is our first time sharing any sports technology related information about Univision with our global readers while covering deltatre has become one of our favorite blog and sport business topics. Univision Deportes, the sports arm of U.S. based Univision Communications Inc., the leading media company serving Hispanic America, has selected deltatre for the provision of a complete Augmented Reality graphics solution for its regular sports coverage and the FIFA World Cup™. deltatre certainly scored a new goal with Univision Deportes by providing augmented reality for the World Cup and Liga MX. I feel this fast-emerging technology is poised to explode upon product development and sports marketing. By offering an unprecedented sense of reality within the TV studio space, Univision Deportes’ sports broadcasting will be reinforced with a unique edge. 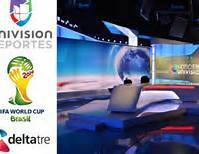 Univision Deportes, the sports arm of U.S. based Univision Communications Inc., the leading media company serving Hispanic America, has selected deltatre for the provision of a complete Augmented Reality graphics solution for its regular sports coverage and the FIFA World Cup™. deltatre’s Augmented Reality system collates sports data seamlessly into immersive virtual graphics that create a thrilling viewing experience. Juan Carlos Rodríguez, President of Univision Deportes added: “At Univision, we are constantly looking for new and creative solutions to provide the best viewing experience for our audience. Through our agreement with deltatre, we will continue in that tradition and take another step forward in our regular coverage of Liga MX and the FIFA World Cup by enhancing the physical studio set with visually compelling graphics and in-depth data and tactical analysis”. The market leading sports media and technology firm will provide Univision Deportes with the design, technology and delivery of an Augmented Reality graphics package including the integration with a third party platform. The package will be used for studio presentation of Univision Deportes’ comprehensive sports coverage. In addition, deltatre will provide a sophisticated multi-touch Touchscreen solution for the FIFA World Cup. The Touchscreen solution will support Univision’s analysts and presenters throughout the duration of the World Cup event with a comprehensive and interactive analysis and information tool. The solution will comprise of detailed statistical information, telestration and video analysis tools, in addition to others. Implemented on deltatre’s Matrics and Magma portfolio, the Touchscreen experience will maximize Univision’ s audience engagement and enable commentators to analyze key actions and stats in real-time. Producing more than 10,000 hours of live sports across its platforms every year, Univision Deportes’ properties portfolio includes rights to the 2014 FIFA World Cup and the qualifiers in the lead up to the tournament, plus 13 of the 18 teams within the Liga MX, the Copa MX, the Mexican National Team, the U.S. Men’s National Team, the German National Team, the DFB Cup, the French National Team, the French Cup, France’s Ligue 1, Major League Soccer, the CONCACAF Gold Cup, the CONCACAF Champions League, the CONCACAF Men’s Under 17, the CONCACAF Men’s Under 20, the CONCACAF Women’s Under 17, the CONCACAF Women’s Under 20, the CONCACAF Futsal Championship, the FIFA 2013 Confederations Cup, the FIFA Under 20 World Cups, the FIFA Under 17 World Cups, the FIFA Beach Soccer World Cup, the FIFA Futsal World Cup, DKB Handball Bundesliga, Murcielagos F.C., international friendlies, Liga Endesa, Formula 1®, and volleyball. Univision Deportes also provides comprehensive coverage on all the latest from the MLB, NBA, NFL and much more. Sports Techie, The news that Univision Deportes will implement an immersive augmented reality graphics solution created by deltatre is outstanding for our Hispanic and Latino community members who have access to this digital content via their cable TV provider or over the Internet via their wireless carriers. Our cable provider is Comcast and they carry Univision Deportes. If your providers do not carry Univision, I suggest you send them a note or email explaining how you want Univision Deportes World Cup content that now includes augmented reality eye candy. Of course, like many sports tech broadcast solutions, the new augmented reality component of the Univision Deportes studio broadcast will undoubtedly be sponsored and ultimately brought to you by Corona, KFC or Microsoft. The Touchscreen is a popular studio broadcasting tool we are used to seeing during events such as the NFL draft or NFL combine. Pregame, halftime and postgame World Cup soccer coverage from Brazil will benefit from the Touchscreen efficiency and data driven content. Bravo to Univision Deportes for staying ahead of the curve. Giving your viewers and partners more of the kinds of compelling futbol sports tech that adds layers of data and analysis, as well as sponsorship opportunities, enhances the fan experience for all, in any language.